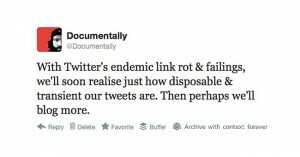 A tweet is not just a tweet – Linkrot and our digital history. When I talk and give workshops I often have a slide stating my concern for the demise of stories on the web. Of course some people use Twitter for just that. Disposable throw-away comments. I doubt micro-bloggers and journalists always feel the same way. Or the people who use twitter instead of email. Or those serialising novels through these channels, seeding projects, replacing letter … [Read more...] about A tweet is not just a tweet – Linkrot and our digital history.